I hope that you all had an amazing weekend celebrating Father’s Day. So, I have to brag for a couple of minutes about the two most important men in my life besides Jesus. I feel like God knew exactly what I needed in every aspect when he handselected my DAD and the father of my children to be mine. Okay, so, I came across this amazing website called Chicwish that offers great quality clothing of the latest styles and trends for an affordable price. I’m currently obsessed with all embroidered tops and dresses. This exact embroidered dress from Chicwish is currently sold out, but I linked similar styles that are still available on their website that are on my wishlist. Check my shop the post below. Yes, I do admit that these lace ups sandals were a recent purchase, and yes, they are so comfortable. They will be on major repeat!! I’m also showing off this darlin’ crossbody purse from Oh So Cute Monograms. The tassel details were just screaming my name. I adore how it can be personalized too. They have so many styles of cute handbags to choose from that are perfect for the summer. P.S. If you didn’t notice, umm, I did finally join the extension bandwagon, and I am SO in LOVE. I am wearing the 18 inch clip in extensions from Irresistible Me. They are 100% human hair, top quality, and extremely affordable. I am seriously so impressed. Use code GET20OFF to get 20% off of your first order. You won’t regret it. Such a lovely dress and that bag is absolutely darling! I love it, might have to see if I can get one too 🙂 The sandals are gorgeous but a tad too high for my liking, maybe I can get a similar lower pair? I love this outfit! So fun and flirty for summer. Love that color lipstick too! 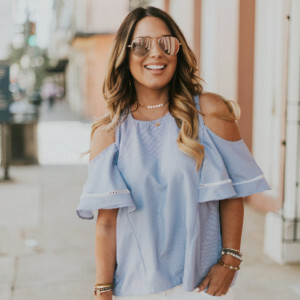 Your monogram purse and tassel earrings are amazing!! Love these little details in this look! I LOVE your dress. I also love how you paired it with those tassel earrings! I’m loooving this post! 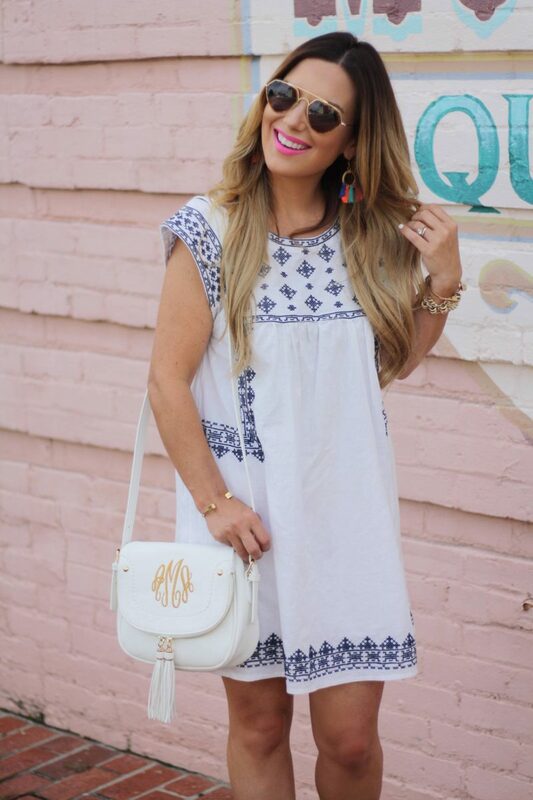 The tassel earrings, the embroidered dress and the monogrammed bag! So so cute girl! Amazing outfit. Beautiful words about your dad and husband! I LOVE that dress as well. 🙂 Perfect for summer! The shoes are cute I also like your dress, very boho. OMG. This whole outfit! The dress. The shoes. The earrings. The monogram. LOVE it! Angelle, you look so amazing! From your dress to your shoes to your earrings to your lip shade! Styling is so on point girl! Love it! You look gorgeous and that lipstick color is incredible on you! The HAIR! I need to put my extensions in – yours look PERFECT! It’s so true, and I think about that often how much of an impact my dad’s love is in my life! Really fun dress, and I’m obsessed with those shoes! Overall, great look! Such a cute summer dress. I love the embroidery detail and the monogrammed purse is perfection! This dress is just lovely! I am obsessed with all things embroidered right now. I have this dress too, but haven’t worn it in ages! You just inspired me to pull it out and re-style it! You look absolutely stunning and I love that you paired the dress with lace up heels! The shoes are super cute and your hair looks amazing!! 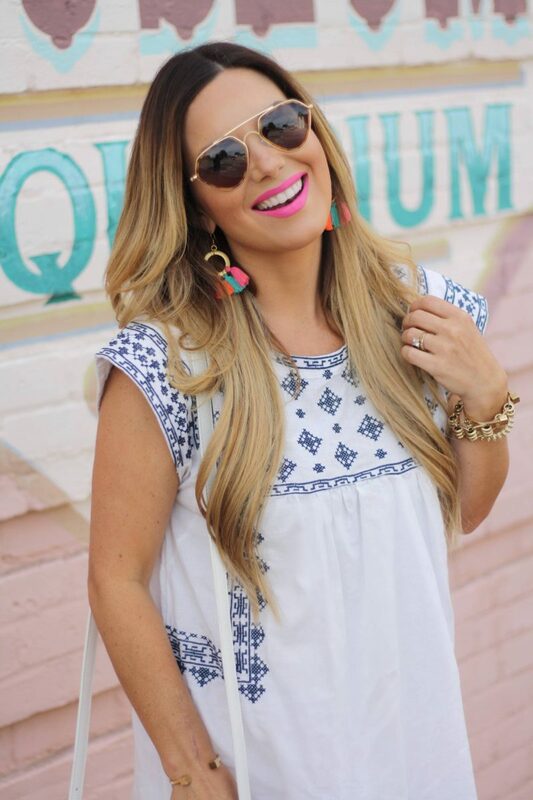 I love love love this look… but especially those earrings! ADORE! SOOO needed that dose of encouragement today! and i love hearing about your faith and your journey with your family! Its incredible! 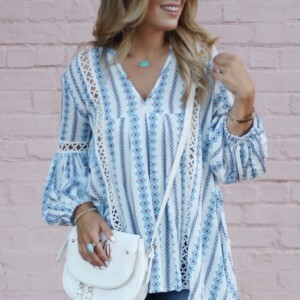 I love this chic boho dress, and how you styled it with fun fringe! Okay this dress is adorable but those earrings are PERFECTION!!! You are adorable, and that dress is so pretty! Plus, I love your pop of hot pink lipstick! I absolutely LOVE chicwish! This dress looks amazing on you!! And I love the shoes! Such a cute outfit! Everything is perfect from head to toe! I can’t tell which I love more – the dress or your fab earrings! Booooo!! YOU are so stinkin perfect!! This look is probably one of my favs on you! And yes, I’m pretty sure I say that with all your looks! HAHA! Love this whole look and LOVING your hair!